Increasingly, I object to collecting mushrooms for the table. I’m not referring to one’s own dinner table. Nor am I referring to commercial pickers, who are collecting for financial purposes rather than the table. Rather, I’m referring to the collection tables that occupy pride of place at local and regional mushroom forays. Here’s the scenario: a brigade of mycophiles lights out for the woods, armed with capacious baskets. Into those baskets, they’ll toss any specimen they find, then bring back those specimens for the foray’s experts (so-called?) to sort and identify. Often the specimens will be accompanied by a dearth of data. What was the substrate? Under a tree. That sort of thing. Then the experts will place names on them with such alacrity that they could be tossing confetti. Never mind that many of the specimens can be identified only microscopically. But there’s worse to come. 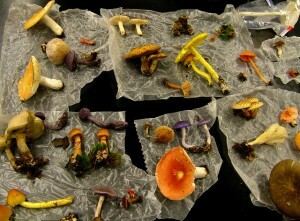 All during the foray, the specimens remain on the collection tables, “dehydrated, shriveled, and stanched from releasing spores,” in the words of mycologist Nicholas Money. In the end, virtually all of them will end up being dumped into a garbage bag. Not set aside for an herbarium. Not spreading a single viable spore. Not oven-dried for future study. Simply turned into trash. Hardly a fate any self-respecting mycelium would wish on its fruiting body. To collect or not to collect, that is the question. Personally, I think it’s nobler to study specimens in the field than to watch them dessicate on a table. And if they’re studied in the field, mycophiles might learn a bit about how different species relate to their environment. They might also ask themselves some questions: Why are insects congregating on a certain mushroom? What’s the smell of a particular mushroom (dehydrated specimens usually don’t have a smell)? And what the blazes is that tree under which the aforementioned species was growing?